Services - Ideal Coatings, Inc.	Services - Ideal Coatings, Inc.
Epoxy floor coatings are available in custom colors and mixtures and are durable throughout the bitter Northern Indiana winters. We also offer easy cleaning with antimicrobial options which are now available! Epoxy floor coatings are an ideal solution for garages, kitchens, finished basements, and showrooms, as well as industrial and commercial installations such as kitchens in restaurants, and health care facilities, auto repair shops and manufacturing plants in Northern Indiana. Highly durable and easy to clean, an epoxy floor coating is a high-performance surface that means you don’t have to worry. Because it’s easy to clean, it keeps maintenance costs down, and with antimicrobial options available, it is ideal for regulated areas such as commercial kitchens, medical facilities, and pharmaceutical companies. An epoxy floor coating gives your floor a natural shine, and since it’s easy to keep clean, its beauty always shines through. You can choose from an endless variety of colors, and add flair with a Dur-A-Quartz or Dur-A-Chip surface for a smooth, decorative surface. 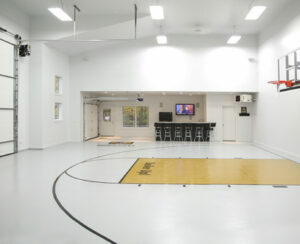 Epoxy floor coverings are available in custom colors and mixtures. We will work with you to create the perfect epoxy floor to suit your needs, and to match the color and design scheme of your environment. The process starts by simply clicking the button to the right and filling out our flooring quote form.